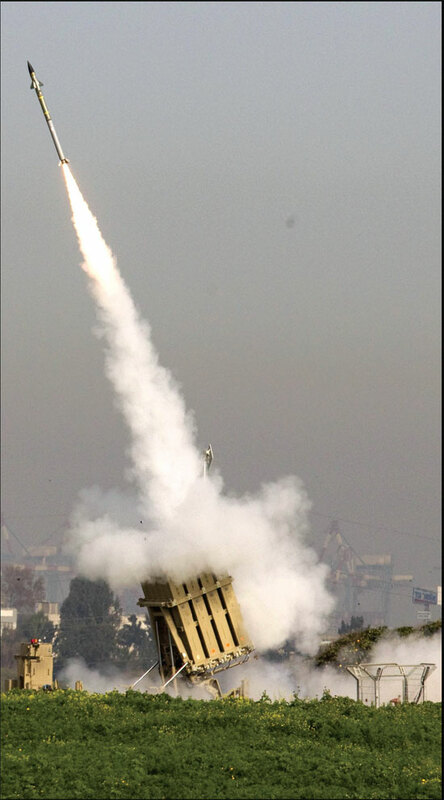 An Israeli missile is launched from the Iron Dome missile system in the city of Ashdod in response to an alleged rocket launch from the nearby Palestinian Gaza Strip yesterday. Sixteen Afghans were killed by a rogue American soldier who walked off his base and opened fire on them in their homes in the early hours of Sunday, Afghan and Western sources said. An AFP reporter counted 16 bodies -- including women and children -- in three houses in two villages of Panjwayi district in the southern province of Kandahar. The world powers are on course for a new diplomatic clash over Syria when foreign ministers from the main UN Security Council nations meet on Monday. What was intended by the British organizers of the event to be a review of the Arab Spring uprisings will be overshadowed by the divide over how to stop President Bashar al-Assad's deadly assault on opponents. Boosting exports from India to Iran would not only help right lopsided trade but also deepen ties between the two countries, a major Indian delegation said on Saturday at the start of a five-day visit. “New Delhi is seeking to increase its exports to Iran and sees the increase in trade as a sign of deepening relations,” Rafeeq Ahmed, president of the government-backed Federation of Indian Export Organisations, told a Tehran meeting of Iranian businessmen. Just weeks after the opening of four Chery dealerships in Venezuela, dozens of people are lining up every day to buy the first Chinese cars being sold in the Latin American nation. Unlike competing Japanese and American cars, import preferences granted by the Venezuelan government mean the Chinese cars are cheaper, which has attracted a steady stream of interested customers. With four grown-up children, ample savings and her own house, Lee Hua thought she could live out her golden years in modest comfort. Now, the 77-year-old collects recyclable garbage to make ends meet. In a slow and frail voice, Lee explained how she was forced out of her home and now lives in a shabby rented house outside Taipei, has no money left in the bank and has all but lost contact with her three daughters and one son.